Each new baby brings color to a black and white world – catch a rainbow and celebrate the new arrival with a colorful collection of Crayon Rompers perfect for a new baby boy or girl. 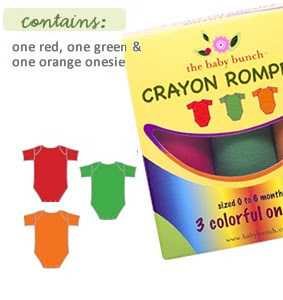 The Crayon Rompers include: one red one-piece, one green one-piece and one orange one-piece, each rolled to look like a crayon; the baby clothes are cleverly packaged in a crayon box for the budding artist. Each one-piece is made of super-soft 100% cotton and generously sized for infants 0-6 months, or up to 16 lbs. Crayon Rompers are a great new baby gift when you don’t know if it’s a boy or a girl. We ship direct and can deliver your best wishes – add a personal message at no additional charge. Co-workers will clamor to contribute, cousins will cry to chip in, grandparents, godparents, and great relations will jump for joy over cute Crayon Rompers. Make a colorful statement with a refreshing alternative to traditional pastel colors and present Crayon Rompers to the new arrival. These are so cute - the way they're packaged and I love the bright colors. Most everything I have is in pink or a girlie shade. That's not normally me but my first girl I think I'll go nutso on pink. I like that these are gender neutral and I love that they're 100% cotton. I only do all cotton. *Follow me @jamaise at Twitter & Tweet this : RT @jamaise #GIVEAWAY #WIN - a Crayon Romper Set from The Baby Bunch @ Wishing Penny http://bit.ly/d2Kwcr Ends 8/11 tweet each day for one entry each ! Disclaimer: The Baby Bunch provided me with a free sample of this product to review, and I was under no obligation to review it if I so chose. Nor was I under any obligation to write a positive review or sponsor a product giveaway in return for the free product. These views are my own. What's NOT to love?? This is simply an adorable site! I love the lollipop onesies... They would be a great 'package tag' that turns out to be so much more! I love the blue lollipop onesie! Entered the Vera Bradley giveaway. I love the Large Yellow Basket! And I follow. I love the blue lollipop rompers. I originally loved the floral buckets, but the lollipops are more reasonably priced! GFC follower. I like the Pink PJ Cupcakes set. I follow your blog and I really like the Lollipop Romper Red. Thanks. I LOVE the baby bouquets! I do a lot of baby showers for women at my church....this would be a great gift idea! I like the winter bunch bouquet. I like the pink pj cupcakes. I'm a friend of this blog via GFC, and I also like the Lollipop One-piece. I entered the Tomat onesie giveaway. I entered the Sea chi organics giveaway. I entered the Snappy giveaway. I entered the Thirsties diaper giveaway. I entered the Hot Milk giveaway. I entered the CuZn water filter giveaway. I entered the Hello Mellow body butter giveaway.